You were probably expecting a digital layout today, but I wanted to keep with the Christmas theme. I've run out of Christmas digital layouts to share with you, so I am sharing a cute card with you instead. 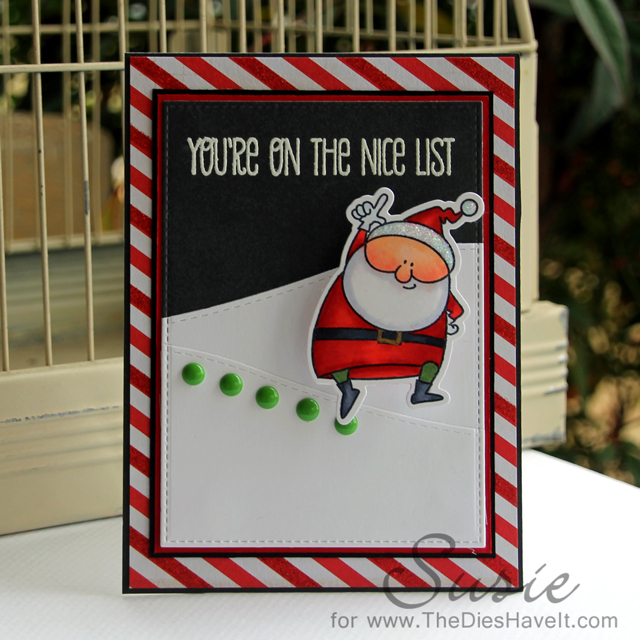 My layered panels, Santa and sentiment are all from MFTStamps. I tried to keep everything simple on this card because I wanted to do something super fun with Santa. Santa is on an Action Wobble so he rocks back and forth with just a flick of the finger. He is pretty much adorable. I hope you like my fun little card today. I'll be right back here tomorrow and I'll see you then. This is so adorable, what a great idea to put him on a wobble!